Happy Hamby Campers: Focus on fuel efficiency! During our ten-plus years together, Nick and I have owned several cars. On reviewing the archives it seems we've bought a replacement vehicle every two years. Of course, we chose to buy Elmer Fudd but all our other car purchases were due to necessity rather than choice. When we merged our households, I owned a Holden Apollo and Nick had the blue Commodore. My car, Kitt (named due to my fondness for the Knight Rider car), was slightly more fuel efficient and therefore used more often. Sadly Kitt was written off in 2006 and we had limited funds available for a replacement. The best we could do at the time was a green Hyundai (top left). What a glamour! Despite it's bargain price, it served us quite well for almost two years and is remembered fondly. For some considerable months it was driven with a stick wedging the driver's window open/closed and the stick would work loose as we drove, resulting in window crashing down and driver/passengers jumping/swearing etc! We traded the green Hyundai for a red one in 2008. The red car was part of a deceased estate and had received very little use. We hadn't expected to get such a good bargain, though the low price may been due to the fact that it smelled very strongly of wet dog (or worse)! In any case it was definitely a step up, not least for the fact that the windows stayed in place without the need for a supporting stick! The red Hyundai was well used, travelling many kilometres up and down the NSW Central Coast. It was even put into service as a camping vehicle for our early trips! It reached the end of it's life in 2012, shortly before we relocated to Victoria. The timing was less-than-best as there was already considerable stress without car drama - but we are used to that! 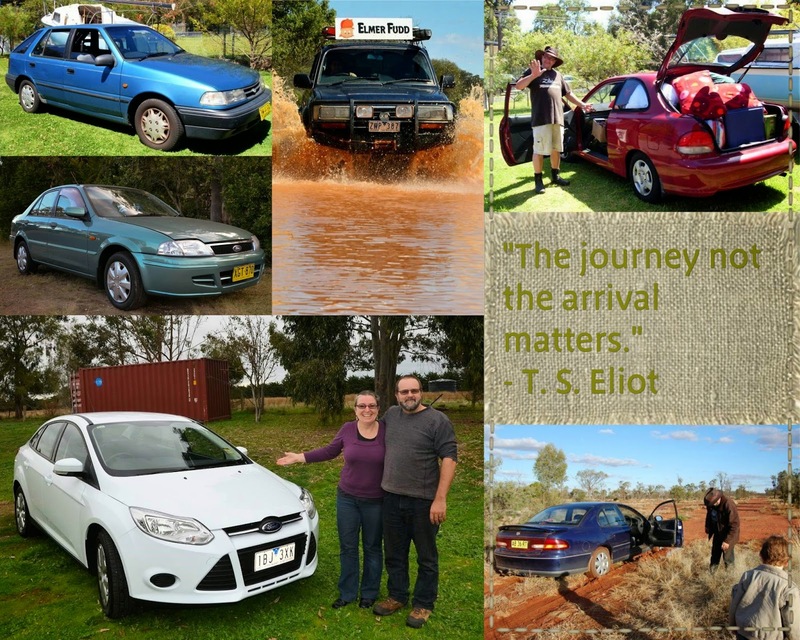 Nick sourced the green Ford Laser as a replacement and it became our "menagerie car" for the drive South. Mintie (as that car was known) broke down last week. The expected cost of repair far exceeded the value of the vehicle, so once again we were car hunting. 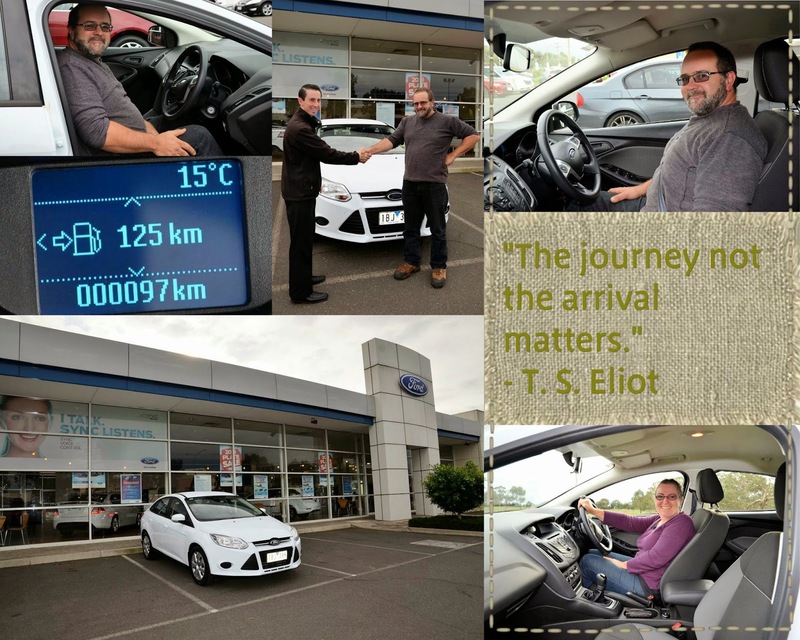 A new car wasn't really on our agenda but after researching more thoroughly it was a much better option than the alternatives - and so we collected our brand-new Ford Focus this morning. It should serve us well into the future! The blue Commodore was with us for over six years before it was traded in October 2010 for Elmer Fudd. We love our Fudd truck but we don't take him everywhere cos ... well, he drinks - a lot! No doubt you'll see a lot of the Focus because as well as being Nick's commuter car it will be used for more fuel-efficient adventuring, closer to home.